“At the age of 68, I continue to go with my instinct of what I think is funny, and I continue to make a living,” Short shares with ATM. 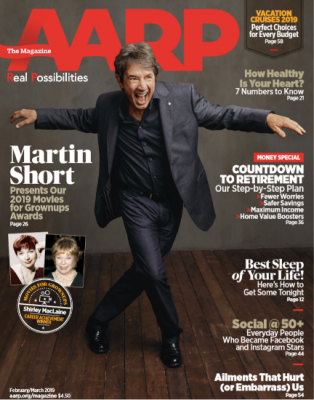 WASHINGTON—Tony Award-winning comedian Martin Short shares his thoughts on film, friends and the pursuit of happiness in an exclusive interview Q&A for the February/March issue of AARP The Magazine (ATM). On February 4, Short hosted AARP’s star-studded 18th Annual Movies for Grownups® Awards, airing on Friday, February 15 at 9 p.m. ET on PBS (check local listings) and streaming the following day on pbs.org/gperf and PBS apps. Over a dozen movies created by filmmakers over 50 are nominated for AARP The Magazine’s 18th Annual Movies for Grownups® Awards including Bohemian Rhapsody, BlacKkKlansman, The Wife and Roma. Tune-in to PBS on Friday, February 15 at 9 p.m. to find out which films and actors took home the coveted trophy from among 2018’s top movies. There’s finally a way to sleep like you’re on vacation every night. Our experts share insider secrets on how to replicate the hotel-bed experience at home, from the types of pillows, comforters, linens, mattress toppers and mattresses. Learn the health status of your heart. AARP reveals the seven essential measurements of cardiovascular wellness, and the simple ways you can tweak your lifestyle to improve them. A key article profiles the eight health ailments that won’t kill you, but they can make you miserable. AARP reviews the latest science and remedies for conditions that get modest media attention but are all-consuming for those dealing with them – from migraines to shingles to fibromyalgia. Meet 18 everyday older Americans who have developed massive followings on Facebook, Instagram, Twitter and other social media. These tastemakers and wisdom-sharers prove that you can be an online influencer at any age. Among them is 90-year-old Helen Ruth Elam Van Winkle, AKA @baddiewinkle, who has attracted over 3.7 million Instagram followers. Discover her amazing story. Planning is key to a great retirement and long-term financial security. To help, AARP’s step-by-step “Countdown to Retirement” guide outlines pro tips for people who are 10 years to three months from retirement. ATM also reveals the seven deadly splurges that could wreck your retirement plan if you’re not already saving diligently – from a luxury automobile purchase to a first-class round-trip flight. Actor and comedian Tyler Perry shares why he decided to ditch the wig and retire his beloved female alter ego, “Madea,” after 11 movies. Also in The A List, check out healthier meal options for Mardi Gras that don’t involve powdered sugar-covered, deep fried beignets. Cruises take the stress out of vacations – as long as they don’t drain your savings. AARP has found nine enticing week-long cruises that span every budget, from deep discount to luscious luxury. Whether you prefer relaxation, adventure or stunning views, we’ve got a trip for you – at a budget you can afford. Plus: how to save on the four things that can secretly drive up the cost of a cruise. It’s never too late to find love. In AARP Studios’ new original series Date My Grandma, grandchildren play the role of matchmaker to help score their grandparents a date. Catch the six-part series debut on Valentine’s Day at YouTube.com/AARP.